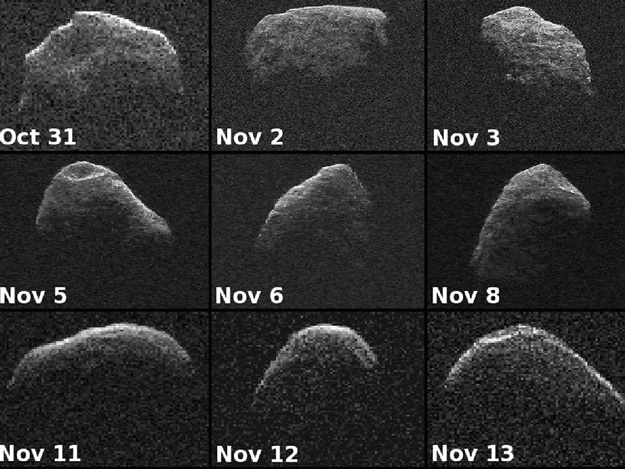 A collage shows nine radar images of near-Earth asteroid 2007 PA8 that were obtained between Oct. 31 and Nov. 13, 2012, with data collected by NASA's 230-foot-wide (70-meter) Deep Space Network antenna at Goldstone, Calif. On Nov. 5 at 8:42 a.m. PST (11:42 a.m. EST/16:42 UTC), the object came about 4 million miles (6.5 million kilometers) from Earth, or 17 times the distance between Earth and the moon. The images of 2007 PA8 reveal possible craters, boulders, an irregular, asymmetric shape, and very slow rotation. The asteroid measures approximately one mile wide (about 1.6 kilometers). Each panel shows one image per day, and all of them are oriented so rotation is counterclockwise. Each image is shown at the same scale and covers 1.1 miles (1.7 kilometers) from top to bottom. The resolution of the images varies from day to day as the asteroid's distance changed. The images achieve resolutions as fine as 12 feet (3.75 meters) per pixel on Nov. 5 and 6, when the asteroid was closest. The resolution was 25 feet (7.5 meters) per pixel on Nov. 2, 3 and 8, and 62 feet (18.75 meters) per pixel on Oct. 31 and Nov. 11 to 13. New radar measurements of 2007 PA8's distance and line-of-sight velocity refined calculations of its orbit about the sun, enabling reliable computation of the asteroid's motion for the next 632 years. 2007 PA8 is not a threat to Earth. The 2012 flyby was the closest since 1880. The next flyby with Earth closer than the one that occurred this year will be in 2488, when the asteroid will approach no closer than 3.6 million miles (5.8 million kilometers).